When Steph Evans ran a short “hints and tips” art course she never imagined that it would turn into a valued weekly activity at Christ Church. Now, 5 years later, she is standing down as leader of Art Group, but the group will continue to meet informally on Friday mornings. This entry was posted in Community, People on July 21, 2017 by Phil. In April 2017 we welcomed Karen Johnson as our Senior Administrator. After a busy first week she spoke in a Sunday service and explained her background and what excited her about this new role. This entry was posted in People on April 10, 2017 by Phil. 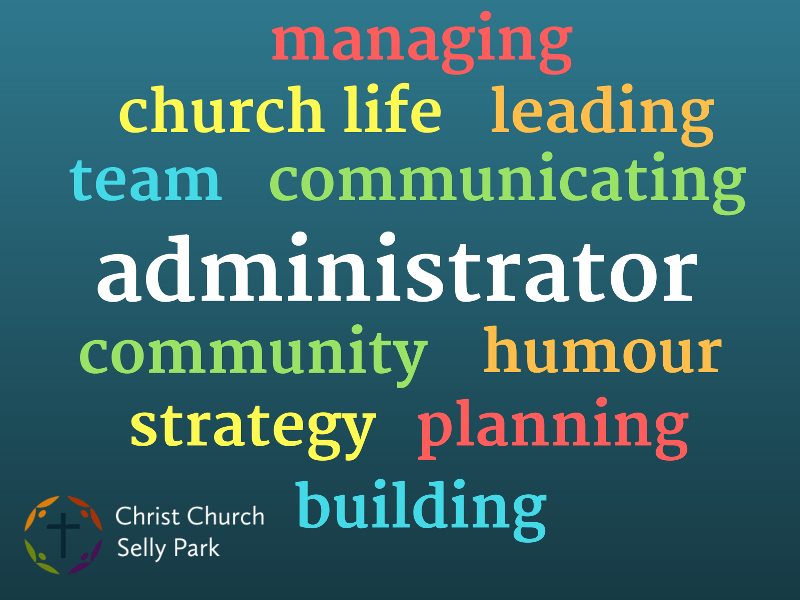 Christ Church is in the process of appointing a Senior Administrator. Applications have now closed. Thank you to everyone who has applied. This entry was posted in People on January 24, 2017 by Phil. Nexus provides friendship, fellowship and social activities for people in the 18-30’s age range (including students) in Christ Church. In summer 2016 Emily and Natalie took over the leadership. This entry was posted in People, Youth on August 11, 2016 by Phil. John Howell has been appointed as Christ Church’s youth worker. In this article John introduces himself and looks forward to his new role. This entry was posted in People, Youth on June 30, 2016 by Phil. When Ellen Dann left us last summer to go on maternity leave we held on to the hope that she would return, but she has now accepted another post nearer to where her husband Colin works. We held a party to say goodbye and a big thank you to Ellen. This entry was posted in People, Youth on January 25, 2016 by Phil. “Daunted, but also excited”. That’s how Rachel Fasham describes her new role at Christ Church. It’s part of the Diocese of Birmingham’s Growing Younger initiative which aims to reach out to children and their families with the good news of the Gospel. Here she explains why she took on this role and what she will be doing. This entry was posted in Children, People on January 12, 2016 by Phil. Our youth worker Ellen Dann started maternity leave in July 2015. During the last few years she has made a huge contribution to the life of Christ Church, while her own life too has gone through dramatic changes. We give thanks for Ellen and all that God has done through her in Christ Church, and look forward to what is still to come. This entry was posted in People, Youth on July 28, 2015 by Phil. As Liz England prepares to get ordained and take up a new post outside Birmingham, she looks back with thanks on her time at Christ Church. This entry was posted in People on June 10, 2015 by Phil.